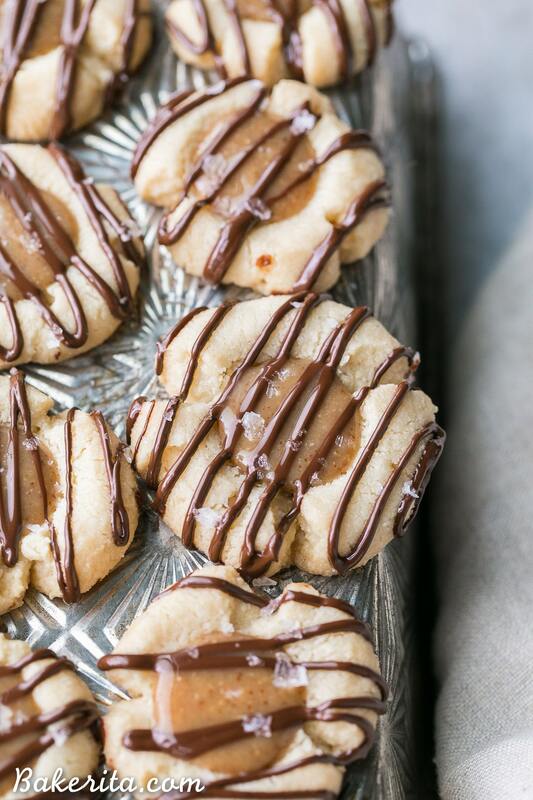 These Salted Caramel Thumbprint Cookies are super easy to make with only 6 ingredients total! 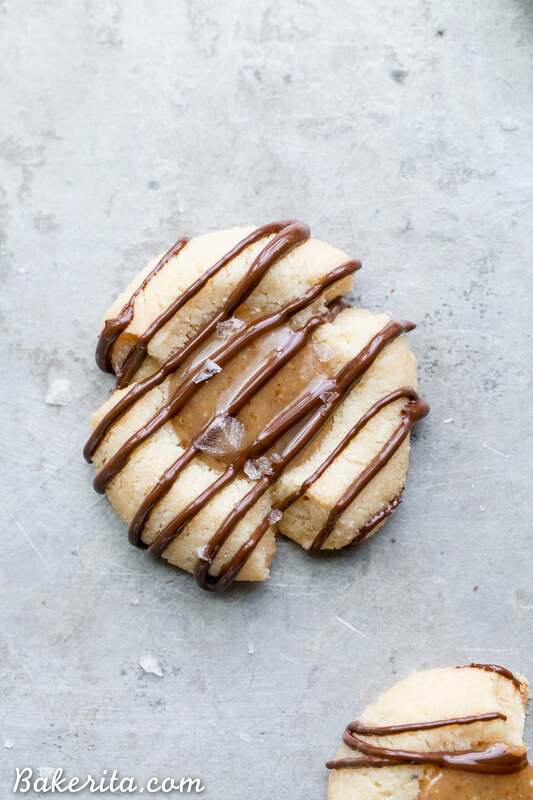 The tender gluten-free and Paleo shortbread cookies are filled with a no-cook vegan caramel and topped off with a dark chocolate drizzle and flaky sea salt. They’re perfect for the holidays! Oh man, I am so full right now. Like, so so stuffed to the brim, full of delicious food. Tis the holiday season, right? I’m just a week ahead of Thanksgiving with the over-eating. Monica from The Movement Menu came over to my apartment today to do some baking and photo-shooting together, and as soon as she arrived and saw the restaurant that’s in my building, she insisted we go there later for dinner. I’m already a frequent patron of theirs and happily obliged. We were starving after a long day of baking pie and chocolate lava melting cakes (coming soon!!!!) and were one of the first people in the restaurant at 5 p.m., practically salivating for some food. Naturally, as starving food bloggers do at a delicious restaurant, we over-ordered a bunch of things to share. And then, we over-ate. We started with life-changing brussels sprouts – I’m seriously obsessed with these brussels because they’re so flavorful and unlike any I’ve ever had. They’re Mexican-inspired, with tortilla strips and cojita cheese and tossed in a jalapeno vinaigrette. Seriously like veggie candy. Followed by the Mornay Fries…topped with a garlic aioli and fried egg egg. Holy cow. Then came the pork spring rolls with cilantro sauce. And finally, the pork sugo, with polenta and fried sage and asiago. We were stuffed before the pork sugo even got to us, but it was so magical that we ate it all anyways, and rolled out of the restaurant, happily stuffed. Now I’m sitting here stuffed to the brim, and I thought I didn’t want to talk about food because of how full I am, but now I’m just excited about all the deliciousness around! And you don’t wanna hear anymore about my meal – you wanna hear about the cookies staring at your face, right?! 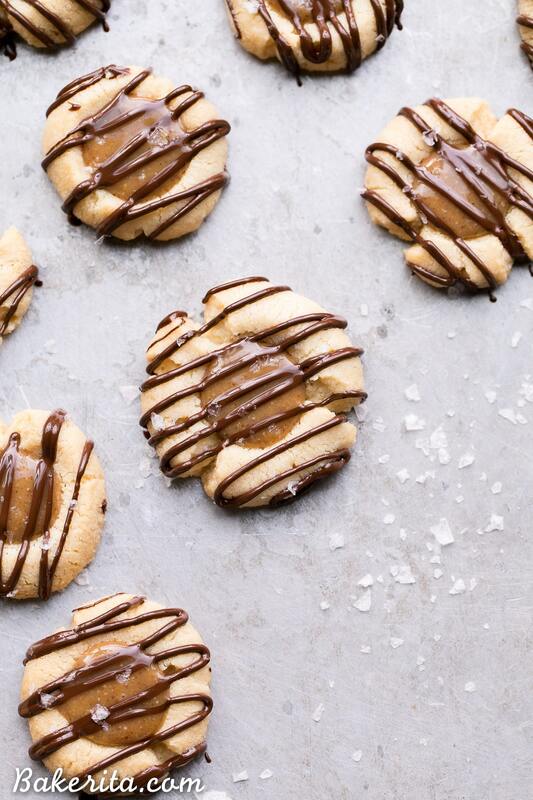 These salted caramel thumbprint cookies couldn’t be much easier. For the shortbread cookies themselves, you only need three ingredients! Blanched almond flour, melted coconut oil, and maple syrup. Stir together, and voila – you have cookie dough. The dough is shaped and baked off, and then filled with the easiest ever vegan caramel. If you’ve tried my Homemade Twix Bars, this caramel filling will seem familiar. It’s so easy to make, and there’s no cooking required. It’s a simple but delicious mixture of almond butter, coconut oil, and maple syrup. You can switch in peanut butter if you’d prefer, too. If you want to avoid any coconut flavor, I’d recommend using refined coconut oil. 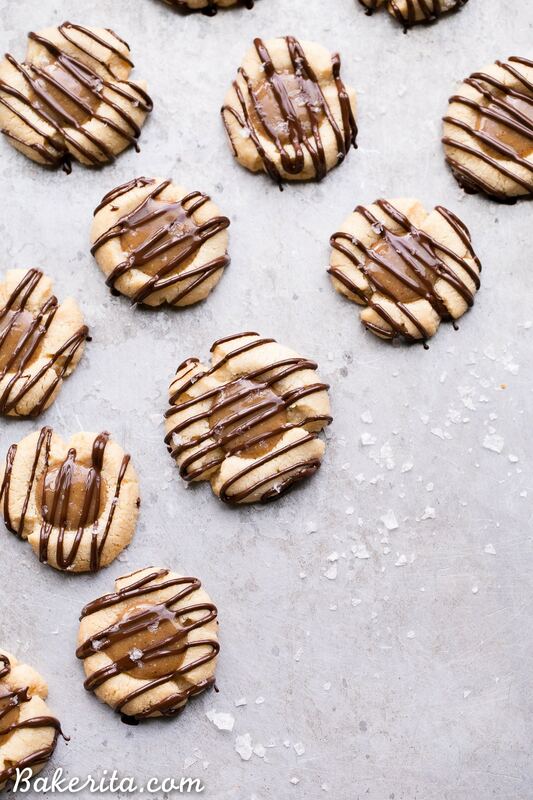 After the cookies are filled with the vegan caramel, they’re drizzled with dark chocolate and topped with a sprinkle of flaky sea salt. After a brief stint in the fridge to firm up, they’re ready to be devoured! 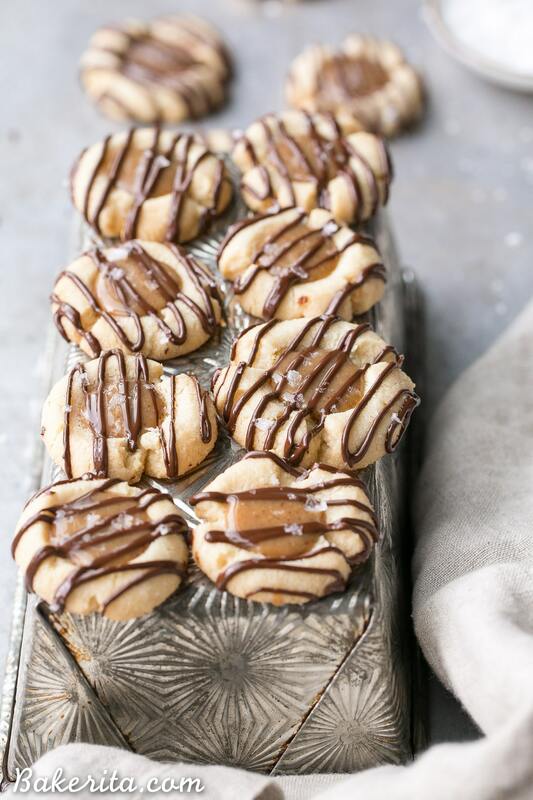 These salted caramel thumbprint cookies are tender, flavorful, and melt in your mouth! When Monica tried one today, she noted that the cookie itself tastes just like traditional shortbread, usually full of gluten and sugar, and she’s right! They do, but way healthier. In a medium bowl, mix together the almond flour, melted coconut oil and maple syrup and shape into a ball. Cover with plastic wrap and refrigerate for at least 30 minutes or up to 24 hours. Preheat the oven to 375ºF and line a baking sheet with parchment paper or a Silpat baking sheet. Form 15 balls with the dough, about 1 tablespoon each. Make an imprint in the center of each cookie with your thumb. Bake for 10-12 minutes for until light golden brown around the edges. Remove from the oven and use a small teaspoon to press down lightly on the thumb imprints again, to make sure theres room for the filling in case they puffed or spread in the oven at all. Transfer to a cooling rack to cool completely. In a small bowl, whisk together the almond butter, melted coconut oil, and maple syrup until smooth. Fill each thumbprint with the caramel. Place chocolate in a microwavable bowl and microwave for 30 seconds. Stir until smooth. Put the melted chocolate in a small zip bag, snip the corner, and drizzle over the cookies. Sprinkle with flaky sea salt, to taste. Place cookies in the refrigerator to set. Keep stored in the refrigerator. Use refined coconut oil if you don't want any coconut flavor. Recipe adapted from my Jam Thumbprint Cookies. Yum! I’m getting ready to do some cookie making this weekend. I seriously cannot wait. I love the comfort food this time of year! Me too! Thanks so much, Megan. Mmm that restaurant in your building sounds delicious! Now it’s making ME hungry! :) And these cookies look so good, Rachel! I love the salted caramel and drizzle of chocolate. My kind of thumb print cookie! Rachel your cookies are gorgeous! You make the best cookies! Love them and I need to try these asap! How fun that you have a restaurant in your building. I would eat there all the time. It probably would not be a good thing for me. So happy you’re loving your new apartment and getting used to everything in SD. Hugs friend! That sounds like a great restaurant, but I’d much prefer to stay home and eat these cookies nonstop ;) I mean who can resist a thumbprint cookie – especially one with caramel filling!! Oh my gosh I’d overeat at that restaurant too. Yum! These thumbprints look amazing. They’re a cookie I love at Christmas, but I’ve very rarely made them myself. These would be a hit at any get together! They’re so easy, you’ve got to try them! Thanks so much Amanda. A healthier version of cookies with caramel AND dark chocolate?! I need these in my life now! These are the cure-all of cookies! Soft, sweet and delicious, and perfect for absolutely anyone. MUST try these! I adore thumbprint cookies and these are gorgeous! Love that chocolate drizzle! Hi I tried making these last night but was having trouble with the dough – it was lacking moisture so the mixture would not bind and I could not form a ball, not to mention form them into smaller balls to then make a thumbprint in them. They kept crumbling! What am I doing wrong/what can be done to fix it? This looks like a delicious recipe. Am I supposed to be using a stand mixer? Thank you for your help! Hi Diana – How odd! Sorry you’re having trouble. I’ve never used a stand mixer for this, so that shouldn’t be a problem. Was the almond flour you were using blanched and finely ground? Sometimes if it’s too mealy, it can make the cookies crumble and not come together into a smooth dough. I’ve made these cookies a bunch and haven’t had that issue – I’d try adding a bit extra maple syrup to help bring the dough together. Hope this helps! Are u able to substitute butter for the coconut oil? I haven’t tried it but it should work! Tried to make these today…. what a disaster! Left my dough in the fridge overnight and of course, it was rock solid this morning. Left it out for a while to get it soft enough to form into balls. Dough spread a lot and the cookies are just a crumbled mess. Curious where I went wrong as I’m not new to baking but I havent used almond flour too much. I feel like the recipe should say that if you leave the dough too long it will get super hard, etc. Hi Elle, sorry you had trouble with these. I’ve never had the dough get super hard after leaving it in the fridge…is it possible you added too much almond flour? That could havw caused the dough to be a lot thicker and the cookies to be crumbly. Allergic to tree nuts peanuts and eggs. Can you use different flour (wheat)? What amounts? Not sure if that would work, but I’d try subbing an equal amount of regular all purpose flour. Hi Rachel, just wanted to ask if the almond flour could be substituted for gluten free plain flour? Hi Saara, I haven’t tested it that way so can’t make any guarantees, and every GF flour blend is different, but it should work! Hi! Just wanted to say that I made these for a gluten and dairy-free friend (minus the chocolate drizzle) and they were (in the words of Mary Berry) ABSOLUTELY SCRUMMY! Thank you so much for posting! Can I use peanut butter instead of almond butter? Definitely! Any nut butter will work.